The Lutheran Church, composed of dozens of different denominations and divisions, has a membership of at least 70 million people in the world! Many of these are merely nominal members who are part of the Lutheran state churches in Europe, while others are devoted and devout, committed to the standards, traditions, doctrines, and policies of this historic denomination. Let me tell my story—the account of a young, sincere, and searching boy who was raised in the Lutheran Church by a deeply religious Lutheran family. Then it happened: I opened my Bible and began to read, study, and ask questions. I searched for the answers from God Himself, as He revealed Himself and His truth in the Scriptures. This article will tell you the story, including all of the surprising discoveries I made in my holy quest. This will be an account of what I learned as I compared my Lutheran background and beliefs with the truth of God revealed in Scripture. Let this record of my examination of God’s Word motivate you to begin a similar search for the answers found in your own Bible! “You will know the truth, and the truth will make you free” (John 8:32). I was a Lutheran. I was born into a devout Lutheran family, was baptized as a child in the Lutheran Church, was faithful in attending the Lutheran Sunday School and church services every week, and was confirmed in the Lutheran Church. I can recall the days of my childhood, deeply immersed in the Lutheran Church of my family. Every Sunday we arose, put on our “Sunday” clothes, and drove to the local church in town. I can recall taking my Sunday School quarterly and dutifully answering the questions. The worship service followed, with all of the formality and ritual by which Lutherans are known. Everything was dignified, proper, and according to the prescribed liturgy for the day. The congregation sang—but the choirs also had their special hymns. After the service, the church bells rang, indicating the end of another weekly visit to church. This was important to my youth and it was part of an entire Lutheran perspective on life. My relationship with the Lutheran Church was part of a thorough Lutheran background. Some years ago, a cousin did a careful search of the family ancestry on my father’s side that reached as far back to Germany of the 1500s. I wouldn’t be surprised if our family went back to Martin Luther himself when he broke with Rome about 1517 when this disaffected Catholic priest nailed his 95 theses to the door of the Wittenberg Church. My grandparents and great-grandparents on my father’s side were devout Lutherans. My mother’s parents and maternal grandparents were also deeply Lutheran in perspective. My father was the President of the area Luther League, an organization of young Lutherans. My mother was the secretary for the national organization of the same Luther League. In fact, they met at the organization’s convention. When they married, they determined to have a thoroughly “Christian” (i.e., Lutheran) home. To repeat, our family was devoutly Lutheran. We had evening family devotions. We had “grace” or thanksgiving at each meal. As a family, our parents read to us from Bible story books. We repeated the “Lord’s prayer” each night. I had personal prayer at bedtime, following the example of my father and mother as they knelt at their bedside each night for prayer. My parents forbad any smoking, drinking, profanity, gambling, lying, or other “wrong” activities. I considered myself fortunate to be born into a Lutheran family and be a member of the Lutheran Church that had so much history behind it. I was aware that Luther himself is credited as having begun the Protestant Reformation. Martin Luther was an Augustinian monk, born in 1483 in Germany. He came to have serious concerns and disagreements with the Roman Catholic Church that had dominated Europe during the long period of the Middle Ages. On October 31, 1517, this Catholic priest challenged the Catholic authorities to debate 95 contested beliefs and practices. Luther widely disseminated his teachings by means of the printing press. Thousands of fellow-Germans rallied to his cause and called themselves Lutherans. At first, Luther didn’t want to break with the mother Church, the Roman Catholic Church, but eventually Luther’s movement broke away from Rome and became a separate denomination. Luther promoted a belief in justification by faith alone, through Christ alone, based on the Bible alone. Lutheranism is often dated at 1530. Melanchthon, along with other prominent Lutherans, formulated a collection of documents in 1580, including Luther’s Small Catechism, Large Catechism, and other theological statements, called The Book of Concord. Confessional Lutherans hold strongly to these doctrinal formulations to this day. In this atmosphere of Lutheranism, something amazing and life-changing happened when I was fifteen years of age. It was at this young age of my boyhood that I opened my Bible and began to read . . . and study . . . and ponder . . . and consider the truth of God for the first time! I asked questions and tried to answer them from God’s word, comparing what I had been taught in my family church with the unerring truth of the Bible. Before this occasion, my contact with the Bible was quite superficial. I owned a New Testament that had been given to me for Confirmation, but I seldom read it. In the Lutheran Church, the members didn’t bring their Bibles, though they generally did carry the Sunday School Quarterly. A portion of the Gospels and Epistles were read in the Sunday morning service. But at this period of my mid-teens, I was surprised to discover that the Bible was not a dead book, not a book for religious leaders alone, and not a religious book meant only for superficial reading or devotional reading of the Psalms. Instead, I came to see that the Bible was the living Word of God with answers to all human need, with teaching that addressed the truth of God, and with direction into the will of God. I also came to see that the Bible taught against many forms of false teaching and error. In effect, it was God’s revelation of the way from our life on earth to His eternal presence in His Kingdom! As the Hebrew writer tells us, “The Word of God is living and active and sharper than any two-edged sword, and piercing as far as the division of soul and spirit, of both joints and marrow, and able to judge the thoughts and intentions of the heart” (4:12). I found this to be true. When I opened the Bible, I found it to be a sword that pierced my heart and judged my thoughts and intentions. I personally discovered the truth of Ephesians 6:17 where the Word is called “the sword of the Spirit” that touches our heart, conscience, and life! My heart was being laid bare day by day, and week by week, as I immersed myself in the sacred contents of the Scriptures. During the last half of my fifteenth year, I began to read and study the Word of God with a seriousness that I had never known before. The Bible became my daily food and drink. Although I had prayed daily, tried to avoid the wrong and do the right, and sincerely wanted to please God, I could now see that God had the answers for our personal needs. God addressed our sin and also our need of a Savior from that sin. Further, I began to compare the truth that I was learning from the Bible with the policies, theology, and practices of the Lutheran Church—the only church that I knew much about. I knew little, but I did know this: God was my Creator and He was my Lord. He had authority over me and whatever He would command, this I wanted to do. I knew that He was right, regardless of what I had believed, what I had done, what my church believed or practiced, or what anyone else happened to believe. I knew that regardless of my age, I simply couldn’t argue with God. Whatever He would forbid, I would not do; whatever he commanded, this I would do. I daily spent large amounts of time in my bedroom with an open Bible, reading literature that I could find to learn more of God’s will and His truth in relation to the church I had known all of my young life. As I read and studied, I became more and more concerned about what I had believed, what the Lutheran Church taught, and what God said was true. I became increasingly uneasy and convicted as I saw a great gulf between the truth of God and what I had always believed. In some cases, there was a radical difference between Biblical teaching and Lutheran tradition. Jesus had said, “You will know the truth, and the truth will make you free” (John 8:32). This quest for spiritual and religious truth became my passion! Let me mention a few of the many concerns I began to have as I read God’s revealed Word during that significant time of my life. Remember, of course, that my understanding as a fifteen- and sixteen-year-old was limited. This is why there is a difference between the limited understanding I had at that time as compared to the more mature and Biblically-based views that I have at this time. Therefore, there is a difference between the reasons why I turned from the Lutheran Church then and the reasons why I would object to the Lutheran Church and theology now. As I searched the Bible, I began to question the denominational status of the Lutheran Church. I learned that there were no denominations or sects in the early days of the gospel of Christ. Jesus said that He would build his church (ekklesia=assembly, congregation)—thus He didn’t establish a religious institution, organization, or denomination (Matthew 16:16-18). As I read the Bible, I came to see that Paul the apostle had warned against calling ourselves after any religious leader. The apostle wrote, “Now I exhort you, brethren, by the name of the Lord Jesus Christ, that you all agree and that there be no divisions among you, but that you be made complete in the same mind and in the same judgment” (1 Corinthians 1:10). Paul went on to rebuke those who said, “I am of Paul,” and “I am of Apollos,” and “I of Cephas,” and “I am of Christ” (v. 13). Indeed, it would have been wrong for them to call themselves Paulites, Apollosites, or Cephasites! I concluded that I was part of a church that was actually named after its founder—Martin Luther. We were “Lutherans” or followers of Martin Luther and his theology. Regardless of how talented this man was, I could see how sinful it was to call ourselves his followers. I could see that this was a “fleshly” or carnal practice, according to Paul’s writings (1 Corinthians 3:1-6). Along with this point, I discovered that the early Christians were simply called “believers” (Acts 5:14), “disciples” (9:1), “saints” (v. 13), “brothers” (v. 30), “children of God” (1 John 3:1), and those “belonging to the Way” (Acts 9:2). They were Christians, nothing more and nothing less (cf. Acts 11:26). They weren’t called Lutherans or even “Lutheran Christians”—or any other denominational label, such as Methodist, Presbyterian, Catholic, Baptist, or Pentecostal. This concerned me more and more. Ironically, Luther himself, in 1522, pleaded with his followers not to call themselves after him: “Please do not use my name; do not call yourselves Lutherans, but Christians . . . The doctrine is not mine; I have not been crucified for anyone . . . Why should I, a miserable bag of worms, give my meaningless name to Christ’s children?” A Time article commented, “Only later, when Roman Catholics used the term as an insult, did Luther consent to let his name be applied to those who agreed with him” (“The New Lutheran,” April 7, 1958). I continued to study my Bible and compare its teachings with what I had thought was the right religious way in the Lutheran Church. I came to see that among the early disciples, Jesus had appointed people to do such works as evangelism (evangelists or preachers), shepherding or leading (the elders or overseers), service (the servants or deacons), and teaching (the teachers). I read many passages that pointed this out—such as Ephesians 4:11; Acts 20:17, 20; 1 Timothy 3:13; Titus 1:5-16; and 1 Peter 5:1-3. I then looked at the Lutheran Church and observed that they generally had a “pastor” and the “church council.” If the “pastor” was the shepherd, why was there only one—when the body of Christ always had multiple shepherds in the local flocks or congregations (cf. Acts 14:22; 20:17)? And where could I find any “Church Council” and Council members in the Bible? These office-holders could not be the “elders” or “overseers” for they did not have the qualifications that Paul taught (see 1 Timothy 3:1-7 and Titus 1:5-9). I came to see that even the titles that Lutheran pastors like to wear—“Reverend” or even “Doctor”—was something prideful that never would have been done in the early days of Christ’s body. I noted that we are not to pridefully elevate ourselves (see Matthew 20:25-28). The early Christians used no religious titles of any kind (cf. Matthew 23:5-12). The Lutheran pastor was clearly the most important person in the Church. All looked to him as the leader and he was held in great respect. He was the one who always wore the formal clerical robes. Yet, Jesus often condemned the religious leaders of his day for the very same issue: “Beware of the scribes, who like to walk around in long robes, and love respectful greetings in the market places, and chief seats in the synagogues and places of honor at banquets” (Luke 11:46). Although the congregational pastor was not adorned to the extent as the Catholic and Orthodox priests and higher clerics, yet they did wear the formal clerical garb, similar to the accompanying example. These contrasts between modern formality, ritualism, and ecclesiasticism continued to concern me as I compared all of this to the simplicity of the New Testament way of Christ. Our Lutheran Church and Lutheranism in general took great pride in having an educated clergy. These professional pastors were looked upon as having the last word in religious knowledge. Once I asked my dear father about certain contrasts I was seeing between what the Bible taught and what our Lutheran Church taught. His reply—and I can hear him in memory to this day—was that Lutherans had thousands of trained clergy, including pastors, professors, and theologians, and who are we to question them! We were merely laymen! They have studied Lutheran theology, thus we are to accept their teachings regardless of what we read for ourselves in the Bible! Sadly, this is a dangerous position. Jesus frequently warned against following religious tradition and religious teachers if they differed with the Word of God. For instance, I read, “Neglecting the commandment of God, you hold to the tradition of men. . . . You are experts at setting aside the commandment of God in order to keep your tradition. . . . [You are] invalidating the word of God by your tradition” (Mark 7:8, 9, 13). Just as the Jewish leaders of Christ’s day were following traditions that set aside the teaching of the Word of God, I came to see that most of us Lutherans were willing to follow the pastor’s words and the official Lutheran theology and traditions rather than taking the teachings of the New Testament seriously. I could easily see that the early Christians were guided by the Scriptures—the Word of God. Jesus had promised that the apostles would be given the Holy Spirit as the Helper who would teach them all things and bring to their remembrance all that Jesus had taught them (John 14:26; 16:7-15). Because of this, the writings of the apostles were the very word of the Lord (1 Corinthians 14:37). The community of Christ or body of our Lord was built on “the foundation of the apostles and prophets”—and the apostolic words became what we know as the New Testament today. No one must add to or take from the divine word of God (cf. Revelation 22:18-19). When I understood this, I wondered how the Lutheran Church, along with most other denominations, could formulate their own doctrinal statements, confessions, disciplines, and creeds. 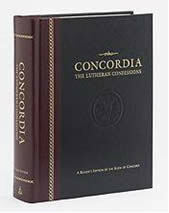 The Lutheran Church had The Book of Concord (formulated in 1580) which contains the Lutheran Confessions of Faith. Many modern Lutherans are not as careful in believing and teaching this doctrinal formulation as more traditional or “confessional” Lutherans are. One authority says, “A Lutheran is a person who believes, teaches and confesses the truths of God’s Word as they are summarized and confessed in the Book of Concord.” This source states that the Lutheran Confessions are the “basis, rule, and norm indicating how all doctrines should be judged in conformity with the Word of God.” They continue, “Confessional Lutheran pastors are required to ‘subscribe’ unconditionally to the Lutheran Confessions. . . .” Finally this Lutheran source declares, “Genuine Lutherans, confessional Lutherans, dare to insist that ‘All doctrines should conform to the standards [the Lutheran Confessions]. . . Whatever is contrary to them should be rejected and condemned as opposed to the unanimous declaration of our faith’” (bookofconcord.org/whatisalutheran.html). If a person is obligated to believe and obey the Book of Concord or any other human document—or filter the Bible through this religious formulation—he is ultimately giving his allegiance to something other than God’s divine word. This troubled me greatly as I considered it. Since it is a denominational organization, the ELCA has an earthly headquarters—in Chicago. The second-largest Lutheran denomination in America is the Missouri Synod Lutheran Church, with headquarters in Saint Louis. I could see that Jesus didn’t establish an earthly headquarters for His body. In fact, only organizations, institutions, and denominations can have or need to have earthly headquarters. The only “headquarters” is where the Head resides—in Heaven (Luke 24:50-51). The simple gatherings of scattered, “called out” believers are far different from this condition. The early community of Christ was composed of autonomous, independent congregations—united only by the bond of love and a loyalty to the gospel and the apostolic authority. In fact, Jesus stated that geographical location of worship is not part of His plan in this new age of the gospel of Christ (cf. John 4:21-24). Further, the Lutheran Church I was raised in had a complete denominational system, headed by an elected President over the entire Church. Although he was not looked upon as the Catholic “Pope,” who has powers in himself to speak forth the will of God directly and authoritatively, yet the position of President was totally foreign to the spirit and teaching of the New Testament (cf. Matthew 20:25-28). Jesus had said, “One is your Teacher, and you are all brothers” (23:8). Church hierarchy was far removed from the simplicity of the early believing community of saints. The Lutheran Church also had Bishops—not the local elders or “overseers” that were found in local bodies of believers in the New Testament period (Acts 14:22; 1 Timothy 3:1; Titus 1:5, 7), but church officers or leaders over multiple congregations or synods. Was this practice something that I could overlook—or was it important to God? There was something basically wrong about “churchianity” or institutional religion for it was so different from the sense of togetherness, community, and fellowship of the early saints. The early Christians continually devoted themselves to fellowship (Acts 2:42-46)—a relationship of brothers and sisters that involved sharing each other’s lives. The early Christians had this “family” relationship with each other—and each brother or sister had a close and intimate relationship with each other. To use Paul’s words, the members of the body are to have “the same care for one another,” and are to “rejoice with those who rejoice, and weep with those who weep” (1 Corinthians 12:25-27; Romans 12:15). John even said that “we ought to lay down our lives for the brethren” (1 John 3:16). Jesus said that His followers would be known by their genuine outgoing love and care for each other (John 13:34-35; 1 John 4:7-5:2). I seemed to experience nothing of this—or very little of it at all—as I grew up in the Lutheran Church. We were simply members of a religious organization, institution, or association—and the members did not have the depth of love for each other characteristic of the New Testament saints, that which should be our norm of life and relationships. We were a church-centered group, loyal to the structure and sanctuary, loyal to the pastor, and even loyal to the denomination, but where was the absolute devotion to Jesus Christ and His way? Today, as I researched the local Lutheran Church that I knew as a child, I discovered that there are 477 baptized people, 385 confirmed members, and the average attendance is 122, with only 58 Sunday School pupils. This gives some manifestation of the lack of true unity, participation, and fellowship—something that is found on every page of the apostles’ writings. It shows that Lutherans, in general, are not interested in daily contact (Hebrews 3:13), and continually meeting with each other for edification (Hebrews 10:24-25), or continually gathering in each other’s homes for meals and fellowship (Acts 2:44-46). Consider a related point. The New Testament clearly teaches that disobedient, immoral, heretical, and compromising believers are to be excluded or removed from the fellowship of the body. This Biblical “excommunication,” as it is sometimes called, applied to everyday separation from daily fellowship as well as participation in the meetings (cf. Matthew 18:15-20; 1 Corinthians 5:1-13; 2 Thessalonians 3:6-15; Titus 3:9-11). As in other mainline denominations, the Lutheran Church seldom, if ever, practices this essential Biblical practice, probably considering it as too radical or expressing lack of tolerance. It is almost as though these many Biblical commands didn’t exist. But the Lord established this vital practice to keep His body pure from immorality, false teaching, worldliness, and unbiblical practices. With this lack of exclusion from fellowship, there is much “freedom” in Lutheran Churches to do whatever one wishes, with some exceptions. Tolerance for various lifestyles, views and beliefs is increasingly promoted. As I think about the Lutheran Church of my youth, I remember that neighboring churches would sometimes have fellowship together. Members would freely associate with members of other denominations. Today we hear of ecumenical efforts in the religious world, with the purpose of eventually uniting various religious bodies into a super church. The more liberal Evangelical Lutheran Church in America has been in the forefront of these efforts. The denominational promotional states that the ELCA “has entered into cooperative ‘full communion’ agreements (sharing common convictions about theology, mission and worship)” with a number of other mainline liberal denominations: the Reformed Church in America, the Presbyterian Church (USA), the Episcopal Church, the Moravian Church, and the United Church of Christ (www.elca.org/What-We-Believe). You may recognize that these are the ultra-liberal, tolerant, and free-thinking religious bodies that often give very little regard to Biblical authority and even make compromises with moral principles. Some accept homosexual clergy and membership, allow for the killing or abortion of babies, promote women as leaders (the Episcopal Church now has a woman as the presiding Bishop! ), promote a liberal political agenda, and numerous other practices and beliefs that conflict with God’s Word. These are the kind of non-Biblical and anti-Biblical denominations with which the largest Lutheran body has full communion! This larger Lutheran body has been in dialog with the Roman Catholic Church, as well. As a young boy, searching for the truth of God, I could easily see that there was an attitude of compromise with the world and a failure to take sin seriously. Not only was there a laxity in minor sins, but glaring disobedience was tolerated. For instance, Jesus had taught that if a married man divorces his wife, except for fornication or sexual immorality, then marries another woman, he commits adultery (cf. Matthew 19:9; Mark 10:11-12; Luke 16:18; Romans 7:1-3). This adulterous relationship would prevent one from entering the Kingdom of God (1 Corinthians 6:9-10; Galatians 5:19-21). In the Lutheran Church, it seemed that not only was divorce tolerated, but even remarriage was sanctioned—which, in most instances, resulted in an adulterous relationship. Interestingly, I was told that after I departed from the congregation, the pastor himself was discovered to have been involved in an affair—an adulterous relationship with a woman member. This laxity in applying clear Scriptural teaching is revealed in the question of who can be chosen as a pastor of a local church. This would be especially the case in the more liberal Evangelical Lutheran Church in America, but it would be found in other Lutheran bodies as well—as contrasted with the more conservative confessional bodies, such as the Missouri Synod Lutherans and the Wisconsin Evangelical Lutheran Synod. (These have their own compromises as well.) One example: After I resigned my membership, the local Lutheran Church called a woman to be its pastor! Even today, I note that the local Lutheran Church of my youth has a woman pastor and woman president of the Church Council! Along with other liberal denominations—such as the United Methodist Church, many Presbyterian Churches, the United Church of Christ, the Disciples of Christ, and others—the liberal Lutherans also ordain women to the ministry! In stark contrast, knowledgeable Bible students, who respect Scriptural authority, know that only men are qualified to be overseers (shepherds/pastors or elders) (1 Timothy 3:1-2; Titus 1:5-6), and deacons or servants (1 Timothy 3:12), and evangelists or preachers (Ephesians 4:11). God only permits men to speak and pray in the assembly (1 Timothy 2:8, 11-12; 1 Corinthians 14:33-37) and have authority over men (1 Timothy 2:11-12; Titus 2:15). These are the kind of concerns that touch the sensitive person who wants to obey the Bible, without compromise. Yet these scriptures are passed off as irrelevant, outdated, or the opinion of mere men. There is no solemn fear of God that treats His Word with awesome respect. This I could see, to some extent, as I compared my Lutheran Church with the teachings of Scripture. The weeks went by and then the months came and went. I spent much of my time cloistered in my bedroom, with the Bible and related materials before me. I spent hours reading and studying. I compared scripture with scripture. As I studied, the Bible became a familiar book—for the first time in my life. As a child, I had learned the simple stories of the Bible, but now I was more concerned with what I should believe, how I should live, and how I should view the Lutheran Church that I had known so well. While others my age were involved in the activities generally associated with fifteen- and sixteen-year-olds, I earnestly studied the Book that held the answers to my awakened heart. The Bible became a New Book to me—one that was both fascinating as well as interesting, informative, and convicting. The Scriptures that I held in my hand became the most important possession I had—one that pointed me to God, to the Lord Jesus Christ, to His wondrous salvation, and to instruction in living a God-centered life in a world gone astray. As I learned more of the Scriptures during those days of spiritual enlightenment, I tried to put them into practice. I knew that many would consider this to be unusual, unconventional, or even radical. However, I came to see that Jesus said, “All authority has been given to Me in heaven and on earth” (Matthew 28:18), and all that He commanded the apostles was to be given to the world (v. 20). I read the sobering words, “Not everyone who says to Me, ‘Lord, Lord,’ will enter the kingdom of heaven, but he who does the will of My Father who is in heaven will enter” (Matthew 7:21-23). Jesus was not only Savior; He was also Lord and meant to be obeyed very carefully. Christ asked, “Why do you call Me, ‘Lord, Lord,’ and do not do what I say?” (Luke 6:46). These statements convinced me that I should not disregard the truths and commands I was learning, but God expected me humbly to submit to them. God said, “To this one I will look, to him who is humble and contrite of spirit, and who trembles at My word” (Isaiah 66:2). I wanted to yield my will to the will of God, as He revealed that will in His inspired, revealed Word. It was a radical choice to make, but I knew that God wanted me to keep a clear conscience before Him as He graciously showed me one truth after another from His Word. This I continued to do. The Lutheran Church has ways of compromising various Scriptural teachings—and justifying this practice through a faulty theology. They have devised a doctrinal term, adiaphora, to refer to what they consider to be matters of indifference. One source states that in 1577 the Formula of Concord was written, defining adiaphora as “church rites which are neither commanded nor forbidden in the Word of God.” The Augsburg Confession states that “the true unity of the Church is enough to agree concerning the doctrine of the Gospel and the administration of the Sacraments. Nor is it necessary that human traditions, that is, rites or ceremonies, instituted by men, should be everywhere alike” (http://en.wikipedia.org/wiki/Adiaphora). If this genuinely pertained to matters of indifference, there would be no problem, but this Lutheran doctrine has often allowed much tolerance and acceptance of false practices. Another authority states, “Philip Melanchthon and his followers, who were willing to accept a compromise confession of faith, strongly leavened with Roman superstition, on the basis that certain doctrines are of minor importance and may be taught or denied without damaging the essentials of the faith” (Alan Cairns, Dictionary of Theological Terms). In this way, a number of unscriptural practices are justified and accepted. The Reformed practice of Calvin in Geneva, Switzerland differed markedly with this doctrine, for he insisted that they must do only that which is authorized in the Bible, while Lutheranism generally teaches that one may do that which is not condemned in Scripture. These approaches are very much in contrast. An interesting point could be made here. Martin Luther is known in history as the leader of the Protestant Reformation and the chief doctrine he espoused was “salvation by faith alone.” By this, he meant that we are justified (declared righteous) or saved by a mental or heart faith—apart from external works of merit or works of obedience. However, he did find a place for good works. He said, “We are saved by faith alone, but not by faith which is alone!” Be this as it may, Luther was known to emphasize faith—and this contradicted the official doctrine of Rome. It is a chief reason the Papacy declared Luther a heretic and under God’s judgment. Unless this emphasis on “faith alone” is carefully defined, it can have disastrous effects. Even in Paul’s day, some were asking, “Are we to continue in sin so that grace may increase?” (Romans 6:1). Some reason: If one is saved by faith alone, apart from works, this must mean that good deeds or careful obedience to Scripture is not really essential. Could this be a reason why many Lutherans are so careless in lifestyle and so indifferent about precise obedience to New Testament teaching? Ironically, along with Luther’s doctrine of “justification by faith alone,” we find that many or even most Lutherans have fallen into a mere churchianity—a religious system that encourages church membership, community service, ecumenical endeavors, social action, political participation, and the like—while tending to overlook the vast importance of personal discipleship, separation from the worldly ways around them, and careful obedience to Scriptural directives for the body of Christ. Where is the priority on Jesus Christ and a close personal relationship with Him? Where is the priority of living a holy, devoted, committed, separated life and lifestyle? Where is the place of the Bible as the life-giving direction for everyday activities and relationships? Where is the Christ-centered, Bible-based, Spirit-energized body of believers—with special reference to family living? Let me mention a few of the items that I learned as I spent those intense months of research as a young but sincere Bible student. I came to see that the early Christians partook of the Lord’s supper (ate the bread and drank from the fruit of the grape vine) every first day of the week (cf. Acts 2:42; 20:7; 1 Cor. 11:17-34). The Lutheran Church only communed every six weeks, as I recall, although some contemporary Lutherans do offer communion each Sunday. The communion I knew as a boy was very liturgical and ritualistic. As members of the church, we would solemnly file to the front, kneel along the railing before the altar, and the pastor would place a small wafer into our open mouths. These wafers are similar to those used by Catholics; they did not use the single loaf of unleavened bread that Paul instructed us to use (cf. 1 Corinthians 10:16-17, see the Greek; Matthew 26:26-29). The New Testament referred to this as the breaking of bread (Acts 20:7) or sharing (fellowship, communion) (1 Corinthians 10:16). The “table of the Lord” was meant only for those true believers who were living holy and uncompromised lives of genuine devotion to Jesus (cf. 1 Corinthians 10:21; 5:11; 11:23-34), thus it was not meant for unbelievers, heretics, false teachers, or anyone else who compromised the pure Word of God. When I learned these facts, I began to partake of this on my own—privately—trying to obey the Lord as best I could, with my limited knowledge. I also learned that my Lutheran Church believed a doctrine called consubstantiation, which says that the actual body and blood of Christ are present “in, with and under” the bread and wine of the Lord’s supper. Luther taught that an actual miracle occurred in this communion. In this matter, Lutheranism differed with both Catholicism (that teaches transubstantiation, an actual changing of the substance of the elements into the literal body and blood of Christ) and the Calvinists (that teaches that the communion as a symbolic memorial). Other things that came to mind were diverse in nature. As Lutherans, we had a very ritualistic worship experience, using a prescribed liturgy that was found in the Service Book or Hymnal. This prescribed liturgical ceremony lacked the warmth and spontaneity that was found in the house assemblies of the early Christians—long before liturgy was formulated (cf. Acts 2:42-47; 1 Corinthians 14). Further, in Lutheran worship, the pastor did nearly everything before the congregation, something that was very much different from the experience of the early Christians—where every gifted male believer used his gifts to participate in the meetings (cf. Romans 12:4-8; 1 Corinthians 14:26). There was an openness of expression in the first community of Christ and people were alive in the Spirit (cf. Romans 14:17). I could also see that the Lutheran Church—like nearly every other modern denomination—is focused on a holy structure that we called a church. I recall the sign over the entrance that worshipers would see as they entered the sanctuary: “Please be quiet. This is the House of God.” I discovered, in the Bible, that the “house of God” pertained to the Temple under the Law of Moses before Christ. However, since the time of Christ, “The Most High does not dwell in houses made by human hands” (Acts 7:48). Today, the “temple of God” is the body or community of Christ, not ornate cathedrals and magnificent, high-steeple church buildings (cf. 1 Corinthians 3:16-17; 2 Corinthians 6:16-18). Jesus said, our worship now is not a matter of special holy structures or locations, but it is worship in Spirit and truth (John 4:21-24). As the worship service began on Sunday mornings, the organ would begin to play softly, then more loudly, as the pastor and officials, along with acolytes and all of the choir members proceeded down the middle aisle to the front altar, where they would take their proper places. The ceremony was filled with much pomp and formality, each person wearing the designated robes, singing the hymn, and walking with a slow, deliberate pace. To us, the Lutheran sanctuary was endowed with a special sanctity. The altar was especially important and impressive. During the service, the pastor, dressed in his white clerical attire and vestments, would turn his back on the worshipers, face the altar which was centered on a cross, and adorned with candles, then he would read the prescribed liturgy for the day. It was a solemn occasion, this Lutheran worship service. Yet, as I read through the book of Acts, as well as the apostolic letters, I could see that New Testament and first century worship was very common, simple, yet deeply spiritual and meaningful. It was a time of joy, gladness, fellowship, edification, and worship. As I considered the Lutheran system, I could see many expressions of ritualism and formalism—all of which was so different from the simplicity of New Testament ways. Lutheranism focused on a “church calendar” that involved holy days, something that the early body of Christ did not have (Colossians 2:16-17; Galatians 4:10-11)—other than the weekly first day of the week (cf. 1 Corinthians 16:1-2; Acts 20:7), “the Lord’s day” (Revelation 1:10). The church also had trained choirs—both youth and adult—the members of which were specially clothed in religious attire. I could see that the New Testament had no such arrangement; the gathered believers did sing “psalms and hymns and spiritual songs” and made “melody” with their hearts to the Lord (Ephesians 5:19), as they taught and admonished one another with these songs (Colossians 3:16). All of this was simple and informal—so different from the Lutheran choirs, with their processionals and recessionals. I was also concerned to discover that the early Christians sung and only sung songs and hymns; they used no mechanical instruments—which were introduced about six hundred years after the New Testament era (cf. Ephesians 5:19; Colossians 3:16). I had never considered such a possibility—for I had been raised with the use of a piano or organ while singing. My grandmother, mother, sister, and others played the piano. When I learned of this, I refrained from singing in the Lutheran services. Step by step, I tried to learn from the Scriptures—and then apply what I was learning, though I was aware that my friends and family would consider all of this to be somewhat bizarre or even radical. Another important feature in the Lutheran Church is that of Confirmation. I had been “confirmed” in a special ceremony when I was about twelve years of age. This came after a year of studying Luther’s Catechism with the pastor on Saturday mornings—along with all of the other Sunday School students my age. At this time, I and my fellow classmates learned the basic doctrines of the Lutheran Church, with special emphasis on such things as the Lord’s Prayer and the Ten Commandments. The Confirmation ceremony, which must have occurred on Palm Sunday or perhaps Easter, conferred the privilege of partaking of Communion and I also became an official member of the local Lutheran Church, with voting privileges. As I read the Bible, however, I could easily see that this procedure and practice lacked Biblical authority. In the early body of Christ that was led by the apostles, there wasn’t a formal training period to learn church practices and doctrines. There surely was no public ceremony or ritual that would confer church membership on children of adult church members, after they completed a prescribed course of indoctrination. Instead, one would immediately become a “member” of Christ’s body when he was born again or saved (cf. 1 Corinthians 12:13; Acts 2:41-42, 47). All of this troubled me further as I learned more and more of God’s Word. It amazed me that others also had not seen these elementary concerns regarding Lutheran teaching and practice. I became more convicted in my conscience as I learned more of these Biblical facts. When I continued to read the Bible, I searched in vain for even one instance of infant baptism. It simply was not there—and many baby-baptizing denominational leaders admit this. 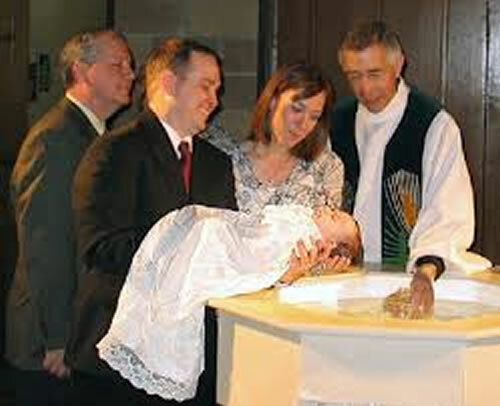 Lutherans often cite Jesus’ words in support of baby baptism: “Let the children alone, and do not hinder them from coming to Me; for the kingdom of heaven belongs to such as these” (Matthew 19:14). This has nothing whatsoever to do with baptism, but it merely was a rebuke to the disciples who did not want little children to be brought to Jesus for His blessing and prayer (v. 13; Mark 10:13-15). In New Testament times, baptism was reserved for those who personally chose to follow Jesus Christ. It was clearly a personal decision of commitment. In fact, it was an integral part of one’s coming to Christ, a decision that the person himself or herself made. Furthermore, Jesus declared, “He who has believed and has been baptized shall be saved” (Mark 16:16). Notice that baptism is based on the faith of the one being baptized—and not of the parents, sponsors, congregation, or the universal body of believers. A proxy faith was entirely unknown in Biblical salvation. The New Testament order and experience is summarized in Acts 8:12: “When they believed Philip preaching the good news about the kingdom of God and the name of Jesus Christ, they were being baptized, men and women alike.” I could see that the Lord said one must believe in Him and His gospel—and then be baptized. Lutheranism reversed this order—that of being baptized (as a child) and then later professing some kind of belief. Baptism means nothing at all apart from an inner faith in Jesus Christ as Savior and Lord. One extraordinary and unique teaching of Luther that has been promoted by conservative Lutherans until today is that God actually gives the “gift” of faith to the tiny infant at the time of baptism. Luther could see that Jesus said, “He who believes and has been baptized shall be saved” (Mark 16:16)—thus he said there was a need to see faith in the baby to maintain baptism of the unconscious infant! Furthermore, Peter said, “Repent, and each of you be baptized in the name of Jesus Christ for the forgiveness of your sins; and you will receive the gift of the Holy Spirit” (Acts 2:38). The context then says, “Those who had received his word were baptized” (v. 41). I could see that one must “repent” and “receive” the word of the gospel—and only then be baptized. This clearly eliminates newborn babies who have no personal sins to repent of and who are not capable of “receiving” the word of Christ, for they are not old enough to understand it. I thoroughly read all I could in the Scriptures on this, and found no justification for baby baptism. On the contrary, baptism was a response of genuine faith in Jesus Christ, sincere repentance of sin, and taking up the cross of discipleship and suffering for Jesus. Many passages showed this to me, such as Matthew 28:19; Mark 16:15-16; Acts 8:12, 35-39; 16:30-31; 18:8; 22:16; Colossians 2:12-13; Galatians 3:26-27. This distressed me deeply—for it touched the very root of Lutheran experience—and of my own life. If this foundational doctrine of infant baptism was faulty and not found in the Bible, what else was I going to discover in my quest? This truth about the nature and subjects of baptism was very convicting to me. I had been “baptized” as a baby (note the baptism certificate above), but if my baptism was invalid because it originated in unscriptural tradition rather than from Biblical command, this would mean that I had not even been truly baptized at all! At the time of the Protestant Reformation in the sixteenth century, the Anabaptists objected to the infant baptism of the three mainline groups—the predominant Roman Catholic Church, the Lutheran Church begun by Luther, and the Reformed Church begun by Zwingli and continued by Calvin. These groups persecuted the lowly, despised Anabaptists, and labeled them heretics. The Anabaptists charged that baby baptism was not a baptism at all, therefore, they insisted on refusing to baptize their children and baptizing only adults. The infant baptizers called these people “Anabaptists”—which meant “Rebaptizers”—for they dared to “baptize” those who had received a ceremony called Baptism in their infancy. Thousands of these Anabaptists of the Radical Reformation were persecuted and even martyred through burning and drowning! Lutherans participated in this incredible, unreasonable, and unjust religious persecution. As I studied this very subject of baptism further, I learned something else that was astonishing—and continued to erode my confidence in the church of my youth. 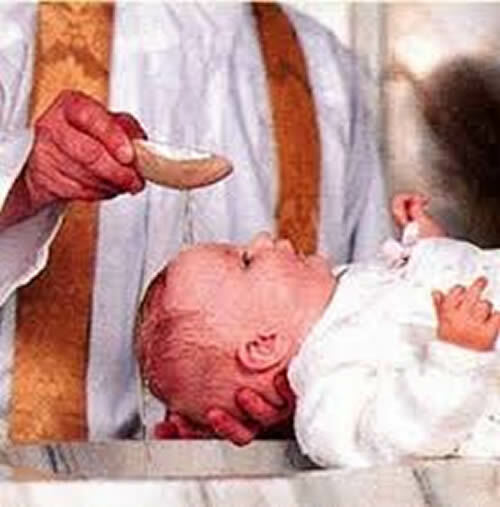 We Lutherans have a practice of taking the young baby before the congregation, where the pastor pours a few drops of water on the head of the child. A baptismal “font” is used for this ceremony. Not only did the early Christians only baptize people who were old enough to repent, believe, and commit themselves to Christ—but I made another startling discovery. As I studied, I came to see that the act of baptism itself is an immersion in water—a dipping of the whole person into the water and a rising from the water. Lutheran historians tell us that Luther himself could see that the Greek term for baptize (baptize) actually means “to dip, to immerse, and to submerge.” Luther wrote: “For to baptize in Greek is to dip, and baptizing is dipping. Being moved by this reason, I would have those who are to be baptized to be altogether dipped into the water, as the word doth express, and as the mystery doth signify” (Works. Wittemb. Ed., vol. 2, p. 79.). Another quotation of Luther: “On this account . . . I could wish that such as are to be baptized should be completely immersed into the water, according to the meaning of the word, and to the significance of the ordinance, not because I think it necessary, but because it would be beautiful to have a full and perfect sign of so perfect a thing; as also, without doubt, it was instituted by Christ” (Luther’s Works, 1551 edition, Vol. 2, p.76). As I recall, even Luther immersed his son! Later, however, he concluded that the act of immersion was not that important, especially as compared to the purpose of baptism. Luther’s followers since his time have been unconcerned about the literal meaning of baptizo as dip, immerse, or submerge. In my study of the Bible during those days of searching, I could see that John the baptizer dipped or immersed people in the Jordan River (cf. Matthew 3:5-6, 16; Mark 1:4, 5, 10). Jesus Himself was immersed, then “came up immediately from the water” (Luke 3:16). I could also see that when Philip baptized the Ethiopian, he took him “down into the water,” then baptized (immersed) him, and then “they came up out of the water”—which indicated an immersion in water (Acts 8:38-39). I learned that baptism entailed a burial and a resurrection from the water—which was symbolic of one’s death to sin, burial with Christ, and resurrection to walk in newness of life (Romans 6:3-5; Colossians 2:11-13). Of course, I could also see that history tells us that the early Christians immersed converts. Only later did professing Christians sprinkle or pour water on people (on babies)—at first for deathly sick and frail people, then later as a common practice. In 1311, the Roman Catholic Church formally approved the application of water on the baby, stating that what is important is the use of water, but not the quantity. (This was also true for the Reformed or Calvinists and Anabaptists.) Lutheranism, obviously, descended from Catholicism and continued this practice. These findings continued to open my eyes to the question of Lutheranism and its relationship to the Biblical authority. Since only a few drops of water had been poured on my head as an infant, this Biblical teaching weighed very heavy on me. The Lutheranism I knew as a child seemed to know nothing about the need of being born again, or being born of God—as Jesus taught Nicodemus (John 3:3-7). This talk of being “born again” was for others, but not for the more “refined” Lutherans I knew. While it was true that Luther spoke of regeneration (being born again), the average Lutheran would never speak of being “born again” or born of God. We thought that this was something that only Fundamentalists could speak about. Lutherans believe in what is called “baptismal regeneration” which means that regeneration is effected by means of this water ritual. The baby is thought to be regenerated separate and apart from inner faith, repentance, or commitment of life—although as we earlier noticed, Luther ironically did teach that God mysteriously and miraculously gave the “gift of faith” even to the unconscious infant! As a Lutheran, I had no conception of making a conscious, decisive choice to follow Jesus Christ. We simply assumed that a child was born into a Lutheran family, would be the partaker of a water ritual called “baptism,” and about age twelve or thirteen, the boy or girl would be confirmed to become a full member of the Lutheran denomination. One simply “grew up” as a Lutheran, lived as a Lutheran, and died as a Lutheran. There was no conscious point of time when one was “rescued from the domain of darkness, and transferred . . . to the kingdom of His beloved Son” (Colossians 1:13). As you can see, this doctrine of infant baptismal regeneration has an enormous implication for one’s spiritual life. Consider this: If one wrongly assumes that he has been regenerated and saved when a pastor sprinkled a few drops of water on his head as a baby, what is the result? The result: Almost all of these “baptized” Lutherans will never—in all of their life—seek to come to Christ for salvation, of their own volition, by their own decision! They will depend on a religious “baptism” ceremony done to them by someone else when they were totally unaware of the meaning! Nearly all of them will go through life, thinking that they do not need to personally turn to Christ Jesus and commit their life to Him, submitting to His Lordship, and applying the benefits of His death to their own life—personally and actually. As Lutherans, we tended to believe that one merely became a good church member, attended services regularly, contributed financially, communed every six weeks, and lived a good moral life. We Lutherans could not point to a point of time when we actually were saved, forgiven, redeemed, sanctified, born again, and reconciled to God—something that is assumed throughout the New Testament. Those members more doctrinally inclined probably would say that all of this occurred in infant baptism. However, if baby baptism was invalid, as I had discovered, then when would salvation be? I continued to learn and become more and more concerned and dissatisfied with the denomination of my youth. Step by step, I came to see that Lutheranism differed markedly from the Biblical way. More and more, I was becoming convicted of my own defective and compromised religious experience! I began to be burdened about my own sin. If I had never really been saved from sin as a baby, if I had never truly repented as a responsible person, if I had not even known the saving gospel of Christ and how it applied to me—personally—I asked just where this placed me. One morning, my mother awakened me with the news that a friend of mine had been killed in a horrible car wreck during the night. If that had been me, where would I have gone? Another friend had drowned a year or more earlier; if that had been me, what would have been my destiny? I began to fear driving in a car, lest I have an accident and I would be thrust out into eternity—unprepared to meet God because of my unforgiven sin. I think that a further concern about the Lutheran Church that I had at this time and even later was the absence of an interest in sharing the gospel of Jesus Christ with others. We just seemed to think that the pastor was the preacher—he is the one who “preached” his Sunday sermon, while the laity merely listened. We had little conception about actually communicating saving truth to our neighbor, our relative, or our local townspeople. Somehow, it just seemed like we were practicing Churchianity, maintaining a church-centered religious existence, but we had little comprehension or interest that the vast majority of people around us are living in sin, lost in that sin, separated from God, and would spend eternity in hell. Because of this ignorance of the spiritual plight of our friends, family, and neighbors, I could see that Lutherans, in general, are not at all evangelistic. They seem to give little or no interest in reaching out and calling on people to repent and turn to God for salvation. In contrast, Jesus declared, “Go into all the world and preach the gospel to all creation. He who has believed and has been baptized shall be saved; but he who has disbelieved shall be condemned” (Mark 16:15-16). As long as there are unbelieving, unrepentant, unbaptized (unimmersed) people around us, there will be the need to share the gospel. The Lord said that “repentance for forgiveness of sins would be proclaimed in His name to all the nations” (Luke 24:47). I observed that we Lutherans virtually never actively “went about preaching the word” as the early Christians freely did (Act 8:4). Perhaps one of the greatest contrasts between my Lutheran denomination and the way of Christ in the New Testament that I discovered related to the characteristic Lutheran lifestyle. Although our family was relatively conservative—by Lutheran standards—the daily life of the typical Lutheran is very little different from others in the world, including members of other liberal mainline denominations. For example, the Lutheran pastor of the congregation smoked cigarettes as he taught class on Sunday mornings! Most contemporary Lutherans might find this incredible, but it is true that many Lutherans then, and now, do use tobacco—without a feeling of guilt or without censure. Some Lutherans used alcohol—and Luther himself was known for his enjoyment of German beer. My fellow-Lutherans seemed to know little or nothing about modesty in dress. Good Lutheran church women wore the finest of clothing, were adorned with many jewels, and cut their hair very short—all of which I could see violated various Biblical principles (cf. 1 Timothy 2:9-10; 1 Peter 3:1-4; 1 Corinthians 11:1-16). One of my Sunday School teachers recounted his bloody days in the military—but the Scripture tells us that the early Christians were harmless, peaceful, and nonresistant (cf. Matthew 5:38-48; Romans 12:17-21). 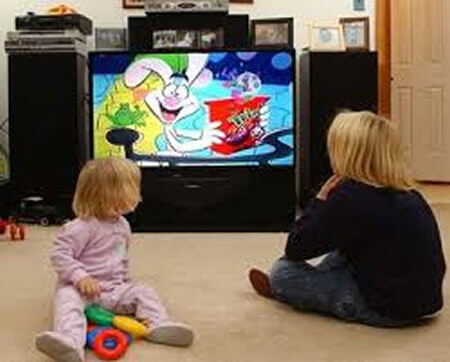 Lutherans seemed to have no problem with modern entertainment, such as movies, TV, worldly music, dancing, sports, and other questionable activities. When I read this and committed it to memory, I can remember how I tried to follow it. I marveled that I had not read this before or was taught it—for I could see that it condemned so many aspects of our lifestyle, as Lutherans. The Biblical command, “Do not be conformed to this world” (Romans 12:2), was quite foreign to the thinking of the members. It seemed that the warning against thinking, speaking, and acting like the world was entirely lacking in the Lutheran teaching we received. Of course, I could see that other passages likewise warned against being conformed to the world and the ways of the world—such as Romans 12:1-2; James 1:27; 4:4. I could see that God was calling me—and all others—to a radically different kind of life than the world. Paul wrote, “If you have been raised up with Christ, keep seeking the things above, where Christ is, seated at the right hand of God. Set your mind on the things above, not on the things that are on earth” (Colossians 3:1-2). People jokingly say, “You are too heavenly minded to be of any earthly good.” But I could see that God calls us to be very “heavenly-minded” as well as doing much good on earth! The term, “Holiness,” in the Bible actually comes from a Greek word that means “set apart” or “separated.” To be holy is to be separated from sin, from the world, from all false doctrine, from all that would defile us. Sadly, it seemed that the Lutherans I knew were hardly more “set apart” from worldly society than anyone else. (The religious surveys that I’ll cite later also reveal this.) Yes, I found them to be friendly and kind, but I could see that God wanted much more than these graces. As I learned this radical teaching of Christ, I can recall that, as best I could as a boy, I tried to apply this to my own young life. I tried to repent and discard anything, any possession, that I thought would reveal a love of the world and its evil ways. Increasingly, I felt more and more alienated from Lutheran doctrine, practice, and lifestyle. In fact, I understood that other denominations also openly embraced the ways of the world. Biblical separation was alien to most people’s thinking. I had to think of my friends in school. Nearly all of them lived compromising lives, even when they were members of our town’s mainline denominational churches. I marveled at how we had missed such an important requirement of the Lord. This experience, as a sincere fifteen- and sixteen-year-old boy, was years ago. I can look back on this quest for truth from a more mature and objective perspective. During the intervening years, I have done much research into the history, theology, and doctrines of the Lutheran Church. 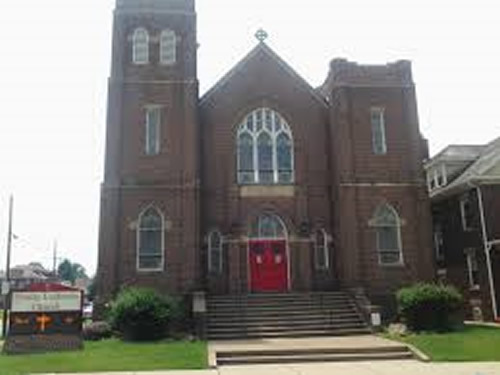 I have visited many Lutheran Churches with an effort to broaden my understanding. I have had many years of advanced study that has allowed me to put all of this into theological perspective. I might add that many of my relatives are still loyal Lutherans. Surveying the New Testament, I can see how Christ called on people to turn from their sins and come to Him for salvation from sin and death. The apostles began to preach the good news of Christ and teach converts in the way of righteousness and truth. The body of Christ was formed on the first Pentecost and continued. Before long, however, false teachers arose and taught ways that conflicted with the ways of Christ and the apostles. Christ warned about this, the apostles warned about it and combated it, and this general apostasy—or turning away from the truth—did occur, even beginning during the days of the apostles themselves in the first century. Many references in the Bible speak of this falling away, particularly Matthew 7:13-23; 24:24; Acts 20:28-30; Romans 16:17-18; 2 Corinthians 11:13-15; Colossians 2:8; 1 Timothy 1:3-7; 4:1-3; 2 Timothy 4:1-4; Titus 1:9-16; Hebrews 13:9; 2 Peter 3:17-18; 1 John 4:4-6; 2 John 9-11; Jude 3. As I continued to learn, during this holy quest, I could see that even in the first and second centuries, and even more in the third and fourth centuries, various false theologies, teachings, and practices invaded the church. Especially after the time of Constantine in the early fourth century, there was massive apostasy that eventually resulted in the Roman Catholic Church in the West and the Orthodox Church in the East. Today historians look back and see how Montanism, Sabellianism, Arianism, and especially Gnosticism arose and turned many away from the truth. Ritualism, clericalism, ecclesiasticalism, formalism, human philosophy, religious tradition, and many other enemies of primitive Christianity arose and flourished. The Catholic Church in the West dominated the middle ages or medieval period in Europe. The “Holy Roman Empire” of Catholicism ruled the masses. Significantly, the Bible was kept from the common people—the very Word that sets people free! This was the apostate Christendom that provided the background of Martin Luther (1483-1546), the Catholic Augustinian monk who sought to reform the Catholic Church beginning about 1517. He and his followers eventually broke from Catholicism as this mother church reacted against Luther’s teachings that they labeled heresy. They placed an “Anathema” on Luther and his followers, consigning them to the fires of hell for their beliefs and practices. Today, there are some 70 million Lutherans divided into dozens of separate Lutheran denominations in the world. The largest body in the United States is the Evangelical Lutheran Church in America, known as a very liberal denomination that is ecumenical in perspective. The Lutheran Church, Missouri Synod, is one of the more conservative bodies, even rightly opposing the Masonic organization as well as evolution. This body is somewhat more Scriptural in some respects, but much more confessional. My understanding as a fifteen- and sixteen-year-old boy was limited, yet I could see enough to make me question the church of my youth—the church of our ancestors. I know that there are some members who are sincere and searching to understand more fully the truth of God. If this describes you, I challenge you to open your Bible and search for God’s will for your own life. Be willing to compare the teachings and doctrines, the practices and policies, of the Lutheran Church with the pure teachings of the Scriptures. Examine the lifestyle, morals, devotional life, and family life of most Lutherans and see how this compares with what you see revealed in your Bible. Remember, the Word of God is the standard by which all persons, doctrines, churches, and denominations are judged. Human church traditions and denominational dogmas will pass away, but Jesus said, “My words will not pass away” (Matthew 24:35). Be like the people of Berea described in Acts 17:11: “These were more noble-minded than those in Thessalonica, for they received the word with great eagerness, examining the Scriptures daily to see whether these things were so.” Be willing to be judged by God’s Word—for it is vital that all we believe and practice be based squarely on that infallible, inerrant, authoritative God-inspired Word. By this Word we must order our lives (2 Timothy 3:16-17), for by this Word we will be judged (John 12:48). Although I didn’t know where my quest for truth would lead me, nor did I know how much I would need to sacrifice for Jesus, I was determined to pay the price and go all the way for Him. Will you also lay aside your allegiance to human creeds and confessions (including the revered Book of Concord), and take the Bible for what it says? 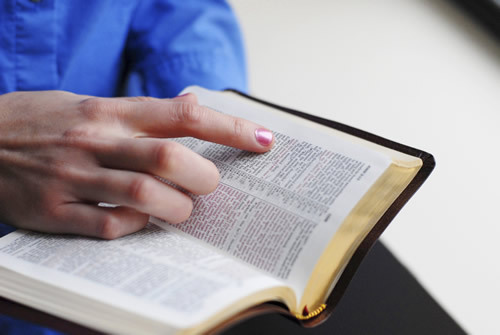 Will you open the Scriptures and let God show you His will so that you might follow it? God’s light of truth was shining increasingly on my spirit and I was gaining more and more understanding of His truth, although sometimes it was painful. Subsequent studies have confirmed many of the truths that God taught me at that time. As a more matured and seasoned student of the Bible, my understandings today would be deeper, and hopefully refined, yet any truth I learned then would be the truth today. There is no one who has left house or brothers or sisters or mother or father or children or farms, for My sake and for the gospel’s sake, but that he will receive . . . along with persecutions; and in the age to come, eternal life (Mark 10:29-30). Today, about half of American religious people have made major changes in their religious connections. People have been willing to leave the church they knew in their youth. It is much easier today to renounce a church or denomination that one discovers to be in error. Furthermore, most people are not as pressured and coerced to remain in a religious system they were taught in their family. It is easier to change. A present-day tolerance of different views and a pluralistic perspective have opened the door to all kinds of personal changes of membership. Don’t let this suggest that it really doesn’t matter what you believe or do religiously. It does matter—and we will be held accountable before God for our choices. Paul warns us, “We must all appear before the judgment seat of Christ, so that each one may be recompensed for his deeds in the body, according to what he has done, whether good or bad. Therefore, knowing the fear of the Lord, we persuade men” (2 Corinthians 5:10). Your parents, pastor, teacher, or any other person will not be able to answer for you; this you will do for yourself! Will you choose to follow Jesus regardless of the consequences, regardless of the cost, and regardless of the personal sacrifice? Jesus said, “If anyone wishes to come after Me, he must deny himself, and take up his cross and follow Me” (Mark 8:34). Paul the apostle was willing to do this, regardless of the serious consequences to his life: “Whatever things were gain to me, those things I have counted as loss for the sake of Christ. More than that, I count all things to be loss in view of the surpassing value of knowing Christ Jesus my Lord, for whom I have suffered the loss of all things, and count them but rubbish so that I may gain Christ” (Philippians 3:7-8). Will you learn what it means to follow Jesus and His Word—and be willing to turn from any religion or church you find to be false? If you are presently a Lutheran—as I was—now is the time to take your stand on the pure, unadulterated, authoritative Word of God, and choose to follow Jesus as Lord over all! We might refer to the foregoing discussion as the first chapter of my story in the spiritual pilgrimage of life. Much remains to be written and shared—perhaps at another time. After my intense and careful study as a fifteen- and sixteen-year-old boy, as reflected in this booklet, I departed from the Lutheran Church. All of the family remained members, as did my extended family. Some years later, my family also resigned their membership, although for very different reasons than those presented in this book. Since that time, God has taken me on a continuing spiritual pilgrimage, seeking and finding a clearer understanding of His wondrous, precious, saving truth—as found in His Word. As a general rule, the Lutheran Church is very liberal and even unbelieving of many Biblical doctrines. 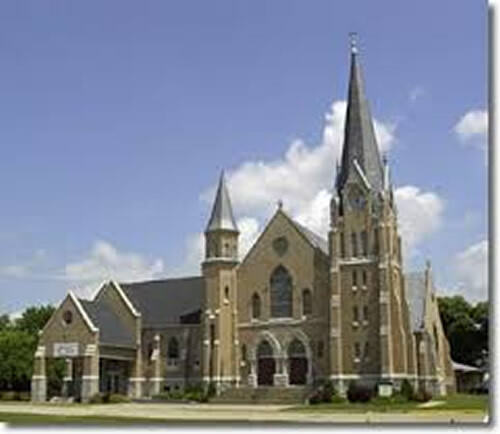 While the Missouri Synod Lutheran Church and the Wisconsin Synod Lutheran Church are toward the right of the center and somewhat more Biblical (however, also more confessional and traditional), the Evangelical Lutheran Church in America, along with other similar bodies, is much more liberal and tolerant in regard to doctrine, morals, and lifestyle. This Lutheran body was formed in 1988, the result of a union of three former Lutheran denominations, one of which I was part of as a young person. Some years ago, the Gallup organization surveyed the religious landscape in America (George Gallup Polls). They presented this statement: “The only hope for Heaven is through faith in Jesus Christ.” Some 58 percent of Lutherans agreed with this obvious truth in Scripture. Presumably, Missouri Synod Lutherans would yield a higher percentage and the Lutheran Church in America would give a lower percentage (Gallup, p.98). But what of the 42 percent of all Lutherans who denied this cardinal fact of the gospel? Another survey asked whether being a Hindu would prevent their salvation (Charles Y. Glock and Rodney Stark, Religion and Society in Tension, p. 108). They also asked about the salvation of Jews and those who are ignorant of Christ. How many could say that these circumstances would definitely prevent one’s salvation? Only 36 percent of Missouri Synod Lutherans and 15 percent of American Lutherans believed that the ignorant would not be saved. Only 31 percent of Missouri Synod Lutherans and 16 percent of American Lutherans thought that unbelieving Jews would not be saved. Further, only 40 percent of Missouri Synod Lutherans and 20 percent of American Lutherans believed that Hindus would be lost. These results again manifest the widespread unbelief among Lutherans! Jesus plainly stated, “He who believes in Him [Jesus] is not judged; he who does not believe has been judged already, because he has not believed in the name of the only begotten Son of God” (John 3:18; cf. 3:36; 20:28-31; Mark 16:16). The apostle John adds, “He who has the Son has the life; he who does not have the Son of God does not have the life” (1 John 5:12). Christ declared, “I am the way, and the truth, and the life; no one comes to the Father but through Me” (John 14:6). How can one be saved and enter God’s eternal presence if he does not accept Christ as the “way” to God, if he does not believe that Christ is “truth” incarnate, and if he does not partake of the “life” of Christ? All of those who refuse to repent before God and place their faith in Christ Jesus (whether Jews, Hindus, Buddhists, Atheists, Agnostics, Muslims, or cultists) cannot have forgiveness and eternal life. Instead, they will suffer death and the lake of fire (Romans 6:23; Revelation 20:11-15; 21:8). A further survey was reported by George Gallup, Jr. and Jim Castelli (The American Catholic People, p. 19). The question the Lutherans and other were asked: “Do you think that a person who does not accept Jesus can have everlasting life?” Some 55 percent of Lutherans denied this statement! Yet, as we have stated above, Jesus said that only those who believe in Him will have eternal life, while those who do not obey Him will suffer the wrath of God (cf. John 3:36). This does reveal that unbelief is much greater among the American Lutherans (who later united with others to form the ELCA) than the Missouri Synod Lutherans—but both groups are less than 100 percent! Let us compare the lay members with the clergymen in the Lutheran Church (George Gallup Polls, pp. 102, 207). Consider the Biblical truth that “God created Adam and Eve, which was the start of human life.” The survey stated that 62 percent of the members affirm this, while only 51 percent of the clergy believe this basic Biblical fact. However, Jesus (cf. Matthew 19:4-6), the apostle Paul (cf. Romans 5:14; 1 Corinthians 15:22, 45; 1 Timothy 2:13, 14), Luke (Luke 3:38), and Jude (v. 14) believed and taught this fact! Yet half of the Lutheran pastors rejected this cardinal Biblical truth! False teachers are not only found among the heretical groups of the first century and the cultists of the 21st Century, but clearly in the contemporary Lutheran Church as well. How many Lutherans could affirm that “the Bible is the word of God and is not mistaken in its statements and teachings?” Gallup gave this result (Gallup, p. 94): 50 percent of Lutherans could accept this fundamental truth! Why couldn’t 100 percent? (John 10:35; 2 Timothy 3:16-17.) Let us continue to other points. In one survey, Lutherans and others were asked whether they “attend church or religious services” more than once a week (Gallup, p. 124). A mere 2 percent of Lutherans could affirm this! Gallup further says that only 38 percent of Lutherans would oppose the “ordination of women to be ministers on an equal standing with men? (p. 237). In contrast, Scripture is clear that only men (males) may serve in a leadership capacity in the assembly (cf. 1 Timothy 2:8, 11-15; 3:1-2, 12; Titus 1:5-6; 1 Corinthians 14:33-37). (Of course, devoted Christian women may also serve the Lord in a non-leadership capacity—cf. Romans 12:3-8; 16:1-2; 1 Corinthians 11:5-6; Philippians 4:3; Titus 2:3-5. Since many Lutherans reject the authority of Scripture, they do not feel obligated to obey its precepts. Another revealing study is found on the website, “Generous Giving,” a place where careful attention is given to a study of financial giving by the various religious denominations. In an article entitled, “Giving Among Church Denominations,” we discover that in 2002, members of the Lutheran Church, Missouri Synod, gave about $631 per person, per year. These members give about 2 percent of their income! The statistics for the larger Evangelical Lutheran Church in America are similar: In 2000, members gave about $603 per person, per year. This also must have been about 2 percent of the Lutheran income! Although we do not believe that giving the tithe (10% of one’s gross income) technically is bound on Christians (cf. 1 Corinthians 16:1-3; 2 Corinthians 8:1-24; 9:6-15), we believe that this should be the absolute minimum that one should give to the work of the Lord and the needs of others! Some, with higher incomes, can and should be willing to give 20%, 30%, 50% or more! We can see from this that Lutherans in general are not willing to give freely and sacrificially to what they consider spiritual causes. The same is true of other mainline Protestants (which average about 2 to 3 percent) and Catholics (with a low of only 1.2 percent of their income to the church)! While a small number of members do tithe, by far the majority do not give nearly that percentage. From all of the evidence in these well-planned and complete surveys, we are prepared to say that many or most Lutherans do not believe numerous truths of Scripture. Many Lutherans do not believe that Christ Jesus is the only way to God in heaven (John 14:6). Many refuse to believe the literal truth of the Biblical statements. Many are “lukewarm” or, more likely, cold in their commitment to Christ and His ways. Most Lutherans do not center their whole life on the ways of the Lord. In fact, many do not even participate in their church, and they contribute a mere pittance of what they could. In summary, Lutherans desperately need a saving relationship with God through Jesus Christ. They need to take seriously the demands of the Lord and the apostles in response to the good news of salvation. They need to repent of their sin, their religious affiliation, their false religious beliefs, their unscriptural religious traditions and practices, and their apathetic lifestyle. 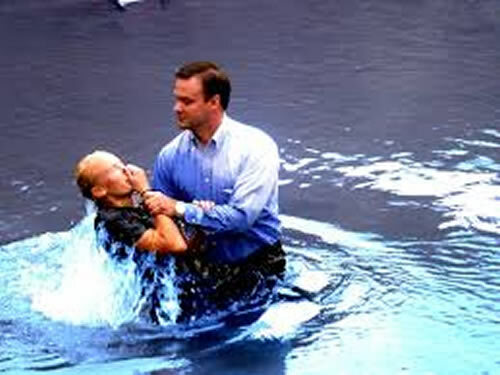 Beyond this, they need to personally place their faith in the crucified and risen Lord of glory and demonstrate this by being baptized (immersed) into a living relationship with Jesus Christ, that they may truly begin a new life transformed by the power of the Holy Spirit (2 Corinthians 5:17). They need to personally orient their entire life according to the Word of the Living God and recognize that the body of Christ (the family of God or community of Christ) is to be completely ordered by the inspired instructions of Holy Scripture. This is what God desires and commands all of us—whether we are Lutherans, Methodists, Presbyterians, Catholics, Orthodox, Episcopalians, or any other professing Christian people. Let us—you and me—continue our journey of life, ever seeking truth, every grasping truth, and never let it go! Let us embrace the God of truth, through the Christ of truth, and be submissive to the word of truth!